This recipe is from the September 2009 gluten free dairy free freezer meal adaptions. My family LOVES this meal! The chicken is so tender and flavorful. Mmm-mmm…. Serve with a big green salad and some gluten free pasta, rice, quinoa, or riced cauliflower to sop up the sauce. Delish! If chicken isn't flattened already, place one piece at a time into a gallon sized freezer bag then, using the flat side of a meat mallet, pound your chicken to ¼ inch thickness. In a shallow dish, combine rice flour, corn starch, salt, pepper and oregano. Heat skillet to medium and place 2 Tablespoons margarine and 2 Tablespoons olive oil in skillet together (add more with each addition of chicken if needed). Working with 2 chicken breasts at a time, coat chicken in the flour mixture and place in the skillet to lightly brown, about 3 to 4 minutes on each side. As each one is done place it in 4 deep dish 8×8 baking dishes. Repeat until all chicken is browned. Adding more margarine and oil if needed, saute mushrooms and garlic in the same skillet. 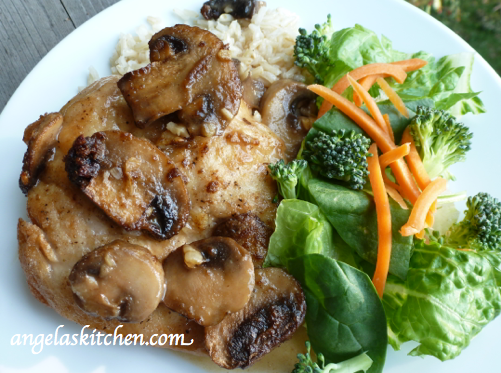 When the mushrooms are done use a slotted spoon to remove the mushrooms and place them on top of the chicken. Use the marsala to deglaze the pan then stir in the chicken stock. Bring to a boil then reduce the temperature. Spoon ½ of the sauce over the chicken. Cover with foil and freeze. Divide remaining sauce among 4 quart freezer bags. Place near pans and freeze. To serve: Thaw. Bake at 425 degrees for 20 minutes or until chicken is cooked through. Heat up additional bag of frozen sauce and toss with pasta. Serve chicken over gluten free pasta, rice, quinoa, or riced cauliflower.